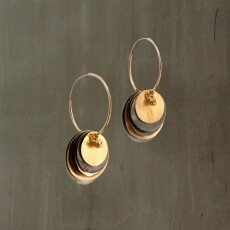 Two-tone necklace features two tiers of graduated hoops handcrafted with 24K Gold plated hammered Bronze. Connected to a 925 Sterling Silver heart with Black Rhodium plated finish. 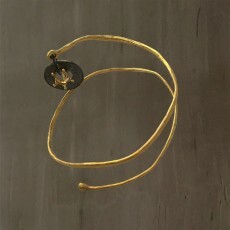 The Waves bracelet, is a lightweight coil bangle handcrafted with 24K Gold plated hammered Bronze. Features two charms a 24K Gold plated crown and a vintage Indian coin casted in Black Rhodium plated Bronze. One size: This design has the flexibility to be manipulated by slightly bending it gently to adjust to the shape of your wrist or arm. May be worn on wrist, forearm or upper arm. 24K Gold plated Sterling Silver hoops with two-tone layered discs handmade from 24K Gold and Black Rhodium plated Bronze. 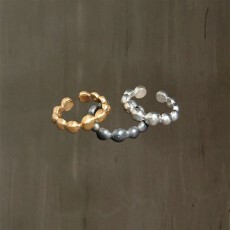 Inspired by the sea, the Aqua Bubbles open band ring is made with 925 Sterling Silver finished with 24K Gold plating. Small handcrafted bubbles are joined to form this rustic ring. Wear it alone or stacked to create your own look. Aleema means deep knowledge, wisdom and a deep inner desire to create and express. The Aleema Jewelery collection is the outcome of the inspiration and passion of the designer to express her creativity through the art of jewelry making. Aleema Christina Tifoudi is the Greek designer behind this collection. She studied silversmithing and jewelry design in Thessaloniki and later attended seminars in Switzerland for further training with qualified professionals. She is involved in the jewelry industry for the past twenty years. Among the designer’s most creative collections are Aqua Bubbles, Fairy Tale, Sculpture and Mother Nature, influenced by the sea, fantasy, symbols and natural elements. You will find items that are a balance between modern and classic designs. 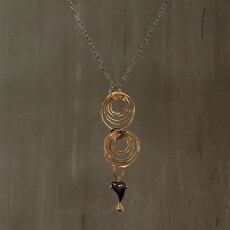 Easy to wear jewelry for women that want to express their individuality and personal sense of style. Unique designs to suit different looks, from everyday casual to evening and special occasions. Using traditional metalworking techniques, each item is individually handcrafted giving great attention to detail using high quality materials, including 925 Sterling Silver, Bronze and Gemstones. A special characteristic in Aleema designs is the Gold and Black finish combinations, which is achieved by applying a double concentration of 24K Gold and Black Rhodium plating to enhance the jewelry’s durability and reduce the rate of tarnish.